Apple Stores saw employee retention rates of 81 percent coming out of 2015, the highest ever recorded according to retail chief Angela Ahrendts, who attributes the statistic to a feeling of connectedness unique to Apple. Also a likely contributor is Ahrendts' attitude toward those in her charge. As she said in a recent interview with Fast Company, Apple retail employees "don't feel like they're just somebody over here working with customers," their jobs have meaning. "I don't see them as retail employees. I see them as executives in the company who are touching the customers with the products that Jony [Ive] and the team took years to build," Ahrendts said. "Somebody has to deliver it to the customer in a wonderful way." After visiting Apple Stores in 40 markets during her first six months on the job, Ahrendts came to understand why Apple is one of the most successful companies in the world. Like devotees who see beyond the products and branding, Apple employees benefit from a deeply entrenched sense of culture, which Ahrendts said manifests in "the pride, the protection, the values." "The company was built to change people's lives," she said. "That foundation, that service mentality, that drive to continue to change lives —that is a core value in the company. And Tim [Cook] then has added his on: He says it's also our responsibility to leave it better than we found it. So you have these two amazing pillars and a culture built around that." That ingrained sense of service is the lifeblood of Apple, but those tenets might not be clear to outsiders. Ahrendts herself only understood after spending time assessing the team, saying Apple culture is "deeper than you would ever imagine" and not only affects employees at the company's Cupertino headquarters, but workers at its Apple Store satellites. Ahrendts' recent comments echo those made during a November interview in which she offered perspective into Apple's current retail operations, as well as plans for the future. 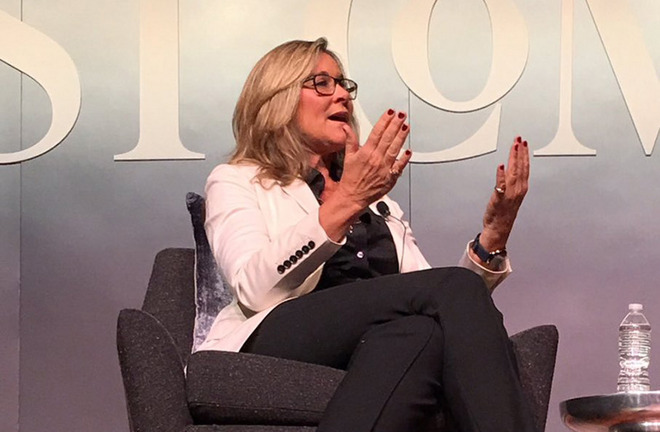 At the time, Ahrendts said Apple is a "pretty flat organization," noting she communicates with her staff directly via email, an uncommon practice for a high-level executive.